We have apps for iPhone & iPad. There are third-party Android and Windows Phone app available. 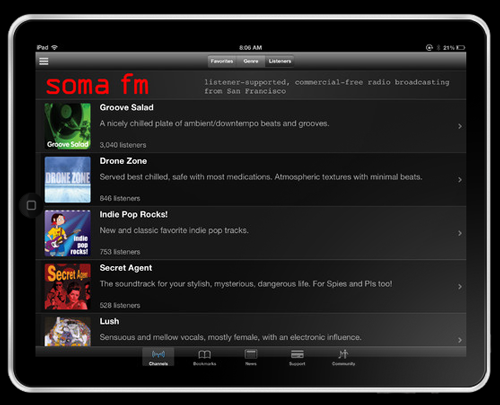 SomaFM channels are all available on the TuneIn app, available for Android, iPhone & iPad, Windows Mobile, Blackberry and many other platforms and connected devices. 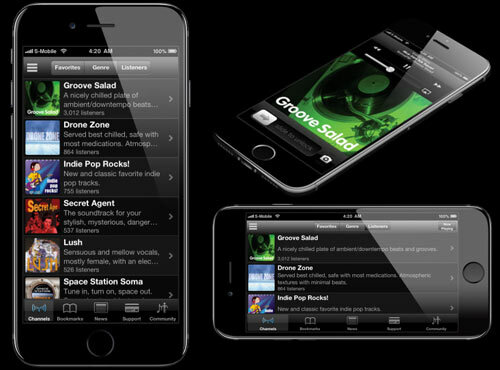 SomaFM can be accessed by the mobile web on many platforms. If you're not automatically re-directed to our mobile site, you can open our mobile-friendly player directly at http://somafm.com/player/. Our high bandwidth mobile streams are 64k AAC-HE, and the low bandwidth streams are 32k AAC-HE. At 64k that's about 30mb an hour; so about 66 hours of streaming would use about 2gb of data. If you use our AAC-HE format streams at 32k, you can stream about 130 hours a month before hitting a 2gb cap. That's over 4 hours a day of streaming every day; 65 hours a month if you have a 1gb cap.